Question: We have an attorney that left our firm the end of October. Is there a way to see which cases she was a service contact for? Answer: Yes, it is quite easy for an eFiling Firm Administrator to see what cases a person is attached to as a service contact. Login at www.filetime.com as a firm eFiling Administrator. Click Admin (A) on the top navigation bar. 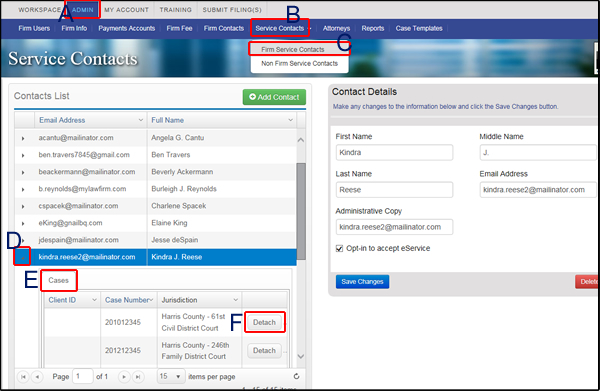 Click on Service Contacts (B) on the sub-navigation bar and then click Firm Service Contacts (C) on the drop down menu. Locate the service contact on the list of service contacts and click the icon in the far left column of the row. That will open the Cases tab (E) for that Service Contact. You will then see a list of cases for which that person is assigned as a service contact. Click the Delete button (F) to detach that person from the case. View this article to see how to add new service contacts to the case.